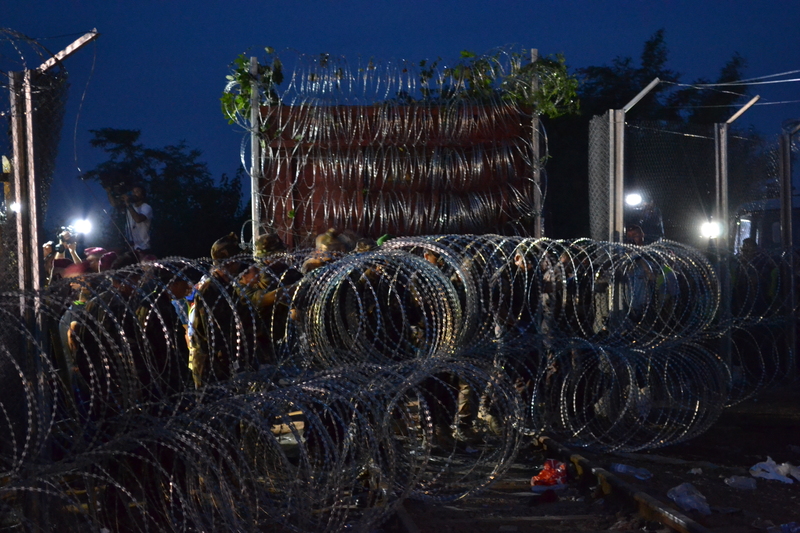 Closing the final gap in the Hungarian-Serbian border (photo: Orange Files). On this night the “new era” begins: the Orbán government is closing the final gap in the Hungarian-Serbian border fence, the place where the now defunct Szabadka-Szeged railway crosses the frontier, the place where tens of thousands of refugees have entered Hungary over the past few weeks en route to the West. The news has spread quickly among the tens of thousands more who are still on their way: Hungary will seal its border on midnight of September 14–15. The push to make it to the frontier before this hour has been intense, a massive forced march up the railway and dusty trackside roads in northern Serbia: the UNHCR official at the border says that his people counted around 29,000 refugees crossing the frontier into Hungary over the previous two days. Refugees pass through the final gap in the Hungarian-Serbian border. Sign along the railway tracks in Serbia about two miles from the border. The first refugees to be stopped at the Hungarian-Serbian border. Hungarian army troops patrol the Hungarian-Serbian border. Refugees waiting to board bus at the regular border. The curtain falls: closing the last gap in the border. Below is an Orange Files video of the closing of the border made from the Serbian side. The murmur of strange tongues. Seen from the corner of Fremont and Cedar political events in Hungary seem so distant, yet so much clearer than they do from inside the country. Especially when one has so much time and emotion invested in the non-stop series of conflicts that embody the Orbán era, the significance of every episode in this sad pageant of futile defiance is magnified to such preposterous lengths that all context is lost when viewed from up close. The landslide Fidesz victory in local elections, the U.S. travel ban scandal, the mass demonstrations against Orbán’s proposed Internet tax: seen from Budapest, vastly important, self-contained events; seen from a small town in the Midwestern United States, constituent elements of a greater whole, mile posts along Hungary’s pathway from the liberal-democratic West toward the authoritarian East. The heightened sense of proportion that comes with distancing oneself from the object under consideration. 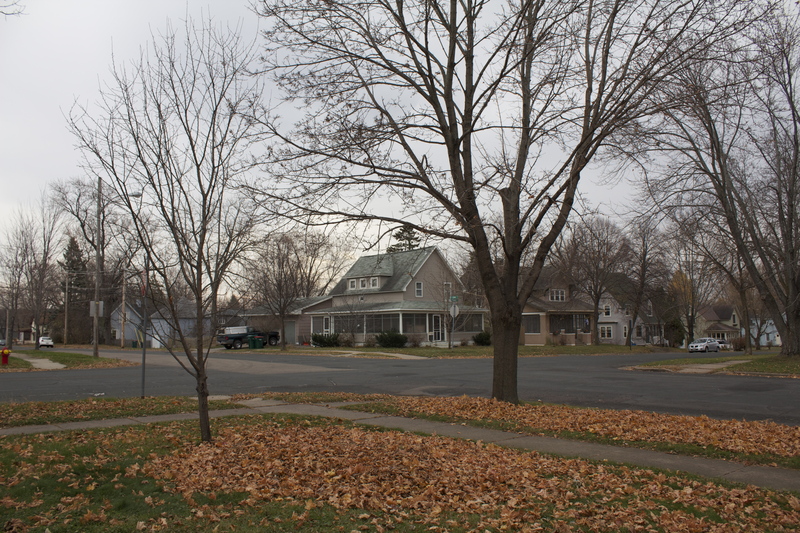 Distance needed in order to contribute constructively to an understanding and—perhaps even—resolution of the problem. But it is so exciting to be there in person. And this may be the central meaning of it all: Hungarians are just too high-strung and bored with continuity to bear the tedium of stability. As Imre Kertész, the Jewish Hungarian author of the Nobel Prize-winning novel Fatelessness, said with regard to the upheaval stemming from the Orbán government’s conflict with Europe: “Nothing new. No problem. And no solution because there is no problem” (see Fateful Endings). 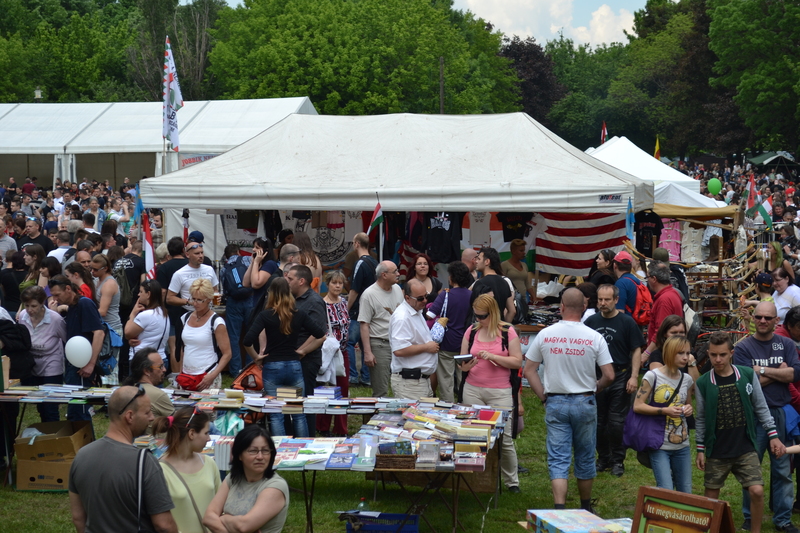 Scene from the annual Jobbik May Day celebration. Always the dilemma for the historico-political observer in Budapest on May 1: which reincarnation of the oppressive twentieth-century isms to observe—the Workers’ Party at its May Day celebration in the City Park or Jobbik at its May Day celebration at Hajógyári [Ship Yard] Island. This year: the neo-communists are on the rise, there is a new freshness to their red, more young people at their events, though they are still very small—only a half percent of the votes in the April National Assembly election. The neo-fascists are also on the rise, very much on the rise, in fact they form the third-largest party in the National Assembly after getting over 20 percent of the votes in the spring elections. Really no contest: on the bike and up the Danube to Shipyard Island to see Jobbik. To the Big White Tent just in time to see the end of a speech from Jobbik European Parliament representative and former presidential candidate Krisztina Morvai: she predicts that the European Union may not last another ten years, because such an “unjust and inhumane” organization cannot survive too long. The banner hanging behind her reads “Shall We Be Members or Shall We Be Free?” in reference to an 1848 revolutionary poem from Hungarian national poet Sándor Petőfi. Morvai still uses the exaggerated facial and hand gestures that make it hard to get a good photo of her. She has also become very plump, though pleasantly so. They say her mother was a top model in Hungary back in the communist days. 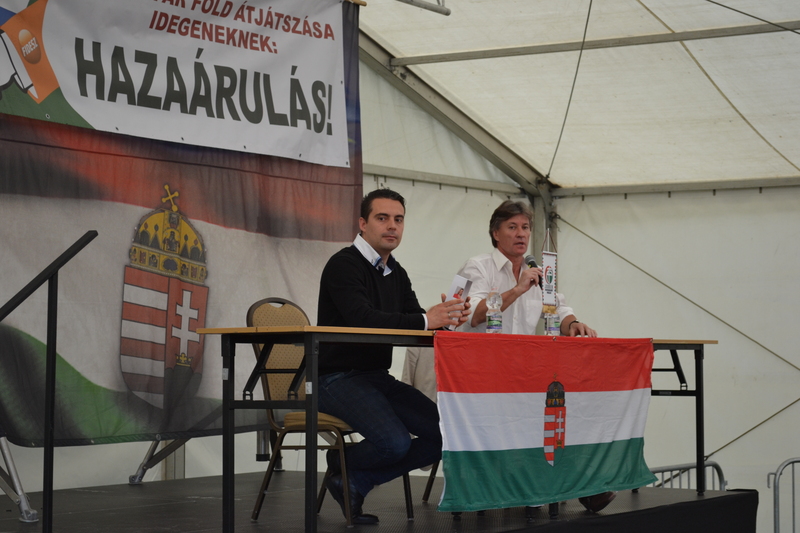 Next up: Jobbik President Gábor Vona and National Assembly representative Sándor Pörzse, a former television journalist and present editor of the Jobbik weekly Barikád who smiles like he’s been told a thousand times that he has a nice smile. Gábor Vona (left ) and Sándor Pörzse. How on Earth can all of those people sit through these speeches? Must be looking forward to the food and drink, watching the fly settle on the head of the lady in front, thinking of something else. 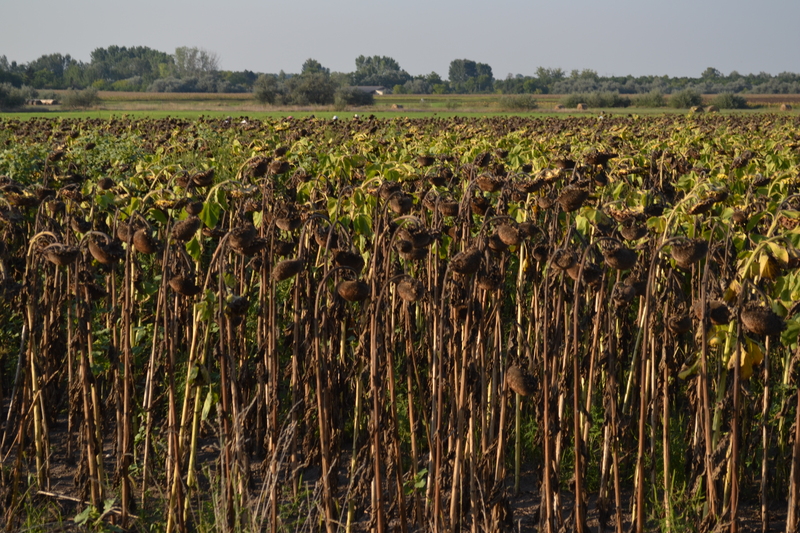 Take a tour around the grounds as Vona drones on about the newest tragedy to befall Hungary—the expiration of the moratorium on the sale of agricultural land in the country to foreigners (i.e., citizens of other European Union countries). The sound of a swooping jet from a nearby air show; Vona announces with mock relief: “I know that the EU doesn’t have any armed forces.” More applause, more derisive laughter. 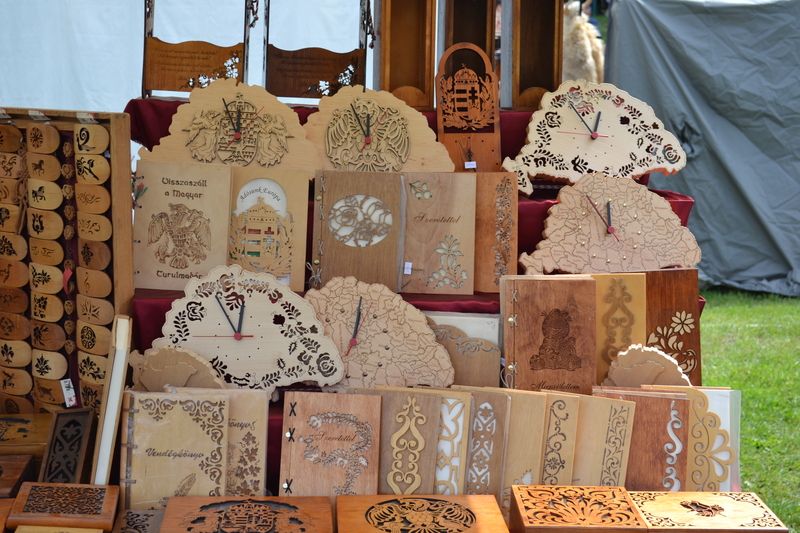 Greater Hungary wall clocks and engravings. This event has become much bigger and more sophisticated than it used to be: five years ago it had the feel of a village market fair—a few hundred people milling about, cheap wares, cheap attractions, the low-fi blare of oration and music; today several thousand people, dozens of stands with artisan-made Hungarian folk clothing, crafts and implements (expensive nationalist-kitsch), kids cracking whips with men dressed as traditional Hungarian Great Plain herdsmen, professional staging, hi-fi amplification. The freshly made potato chips are delicious, but salty to the supreme and raise a mighty thirst. One beer is good, two even better at almost the same price as water. Many others have made the same calculation: faces are ruddy, eyes gleam. Spirits are high on this beautiful May 1 afternoon. Sit on the grassy slope, listen to speech from Pörzse over loudspeakers and he says something that is actually candid and interesting: Jobbik has been unable to form alliances with other radical-nationalist parties in Europe because those from other countries in the region (Slovakia, Ukraine, Romania, Serbia) are anti-Hungarian due to their Hungarian minority populations, while those from western Europe tend to be “pro-Israel” due to their Muslim minority populations. The folly of colliding nationalisms. 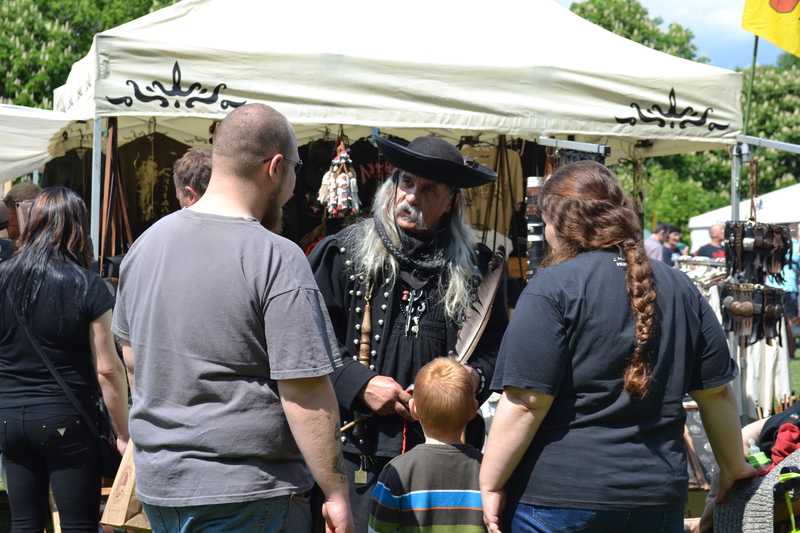 Man dressed as Hungarian herdsman-outlaw speaks to family near stand selling Hungarian folk ware. Back to the Great White Tent for a few more photos before the long ride home. 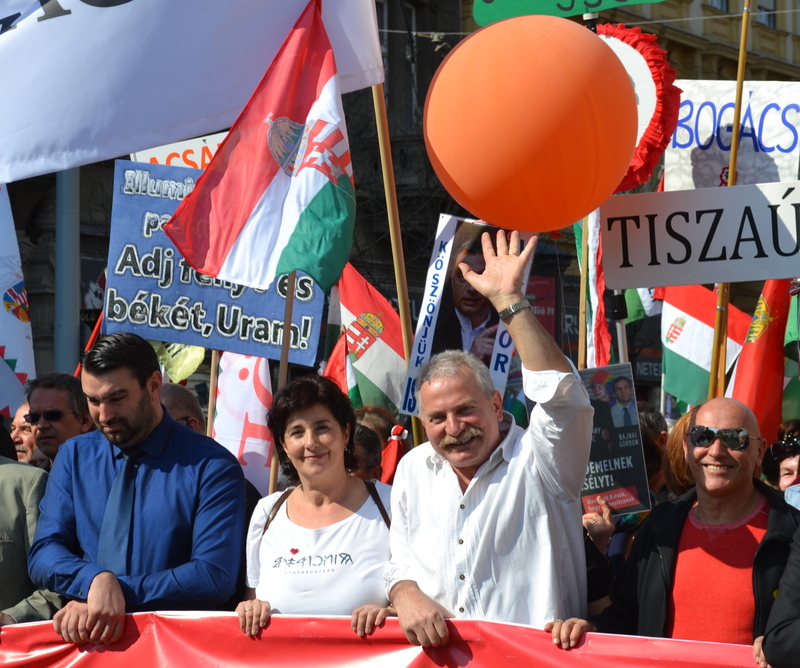 Vona and Pörzse have turned their sights on Hungarian Socialist Party European Parliament party-list leader Tibor Szanyi, a preferred target ever since he gave the finger to the Jobbik National Assembly caucus during a plenary session of parliament last year. Pörzse says he would debate with Szanyi on the spot, though being a holiday the socialist EP-list leader probably wouldn’t be in condition to do so (in reference to Szanyi’s alleged fondness for drink). Look down at feet and Krisztina Morvai is there squatting down right there, listening to Vona and Pörzse castigating Szanyi. She is wearing a loose-fitting Hungarian folk skirt and short-cut embroidered blouse. There is a large gap of rather sensuous bareness between them. The top of the crack of her backside is clearly visible (see This Kind of Place). Stop at the main stage on the way out: a group of drummers in ancient Hungarian headgear and old-fashioned outfits beats out an ominous tribal rhythm. The desperation of radical-nationalist identity-seeking has begun to transcend the boundaries of the absurd in these parts. Then: young women, many of them copiously tatooed, display evening dresses with Hungarian embroidery and nationalist colors (namely the brown-red of the Hungarian uniforms in the 1848 revolution). Up next: concert from the nationalist rock group Ismerős Arcok (Familiar Faces). Heard them last on Szabadság Square in 2007, lead vocalist prompting audience with refrain, cupping ear and holding the microphone outward to catch the mass response: “Ferenc Szálasi!” (name of the prime minister who headed Hungary’s fascist Arrow Cross government in 1944–1945). Unlock the bicycles from the security fencing around the stage. The crowd growing for the start of the main attraction, the coarse faces of those who suffer from poverty, ill-health and lack of education. Looking hard for deliverance, they think they have found it in the form of a party, a movement and a cultural force that make them proud to be who they are and tell them that all their problems stem from the foul doings of internal and external enemies. One gets the feeling that this whole thing is going to get much bigger before it starts getting smaller. And there may be hell to pay for it. The man standing alongside is wearing a shirt bearing the inscription, both front and back: “I Am a Hungarian, not a Jew” [Magyar vagyok nem zsidó]. 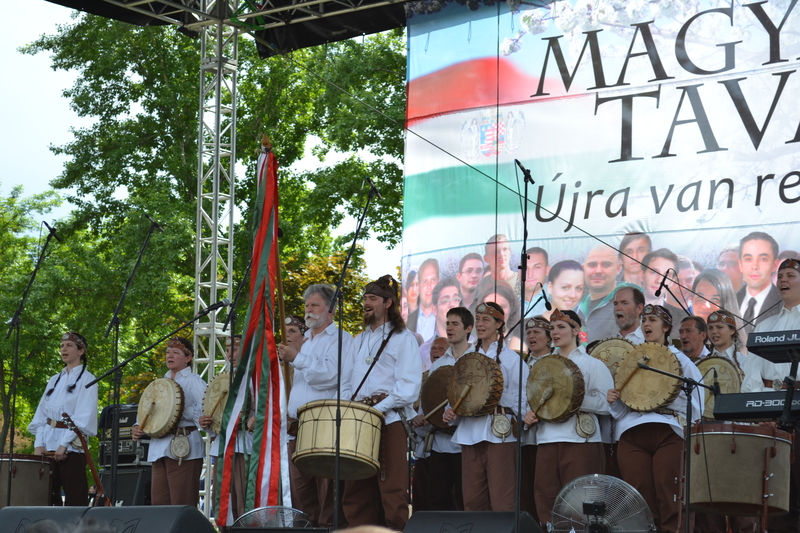 See Jobbik May Day Celebration photo gallery. I Am a Hungarian, not a Jew. Opening the polls in Budapest. The blueness of day has began to materialize on the streets of Budapest. The air is dank and dirty, the pavement wet from a light overnight rain. Soggy cartons, tattered food wrappers, empty bottles and cans, the fresh refuse of a Saturday night in the city. 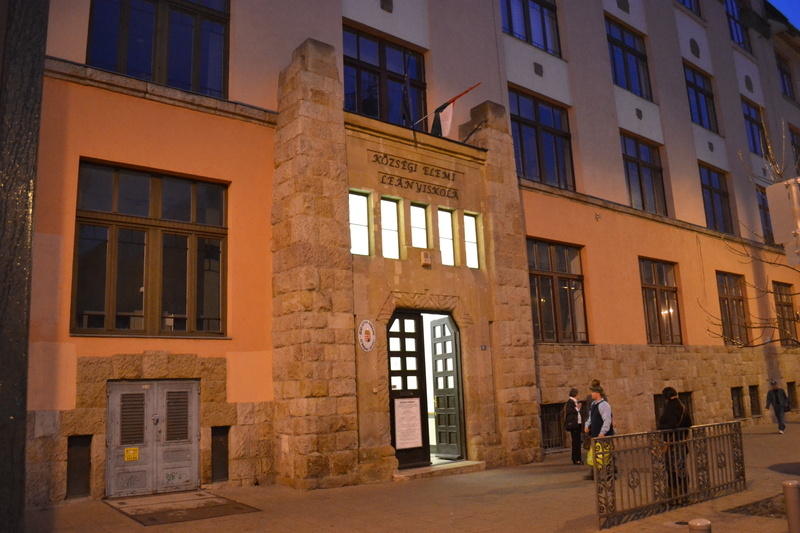 The polling station in the new Attila József High School has just opened. Orange Files steps in, finds the room for the voting district designated on the registration notice: the second voter in the district, he watches the first voter and spouse ceremonially check all three ballot boxes before election officials to ensure that they haven’t been pre-stuffed. The officials close the boxes and tie them shut with red, white and green ribbon. Hungary’s 2014 National Assembly elections have officially begun. Orange Files had always heard—and doubted—that many voters do not actually know whom they will vote for before they step into the voting booth. On this morning, he is living proof of this claim: all of the modern democratic parties have splintered into small factions struggling for survival or joined larger party-conglomerations that still harbor unseemly elements from Hungary’s authoritarian past (but at least not from its authoritarian present). Pull the curtains behind, lay two large ballots on the stand—a small one listing seven individual candidates from the voting district and a very large one listing the eighteen parties that have qualified for national party-list voting. Green? Red? Split ticket? National Gypsy Party just so you can say you did it? Go with the feeling, place the Xs in the Os and get out. Orange Files National Assembly election update from the 25th subdistrict of the 2nd voting district of Budapest as of 6:15 a.m.: Politics Can Be Different (LMP) 1; Change of Government (Kormányváltás) 1; Fidesz 0, Jobbik 0; all others 0. Peace Marchers just off the bus from Dunaharaszti. Bus after bus pulls up to the Lower Quay along the Danube River to let Peace Marchers off: they have come from the provinces, what they call in Hungarian “the country” (vidék), to show support for their beloved prime minister and quasi-messiah, the man who has guided them to the promised land of Hungarian national self-determination and self-respect; the great leader who has led them in battle against western banks ( i.e. the IMF) and organizations (i.e. the EU) and their socialist-liberal accomplices in Hungary. 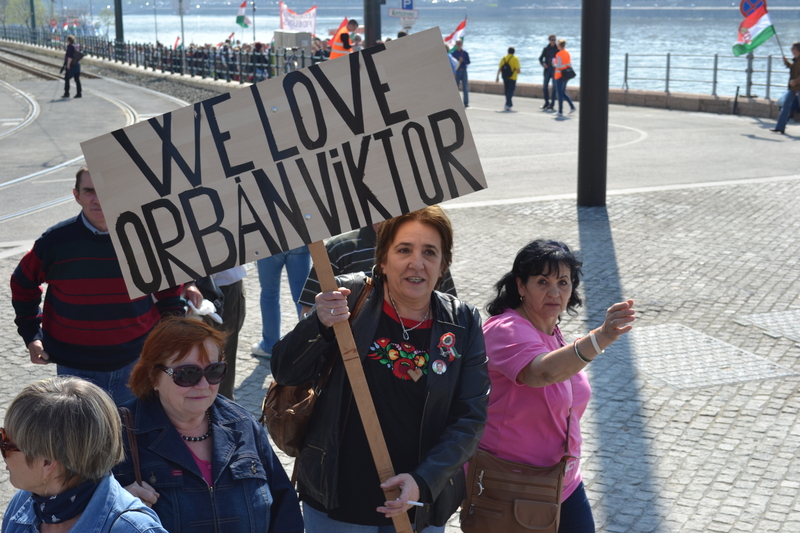 “We love Orbán Viktor” reads the sign in the hands of a lady just off a bus from Dunaharaszti. And they do love him—this is the essential difference between the Peace March demonstrations of the Orbán era and the May Day parades of the communist era: the hundreds of thousands of mostly rural Peace Marchers are voluntary and enthusiastic participants who pay for the bus transportation to Budapest out of their own pockets, while most of the May Day paraders were obligatory actors in a centrally orchestrated pageant of support for a system toward which most of them felt either indifference or aversion. The similarities between the Peace March processions and May Day parades are nonetheless striking: mass demonstrations of support for highly centralized, anti-democratic governments that face no threat whatsoever to their control over all aspects of the established political system. Peace March organizer András Bencsik. A beautiful, warm spring afternoon, the first short-sleeve day of the year. 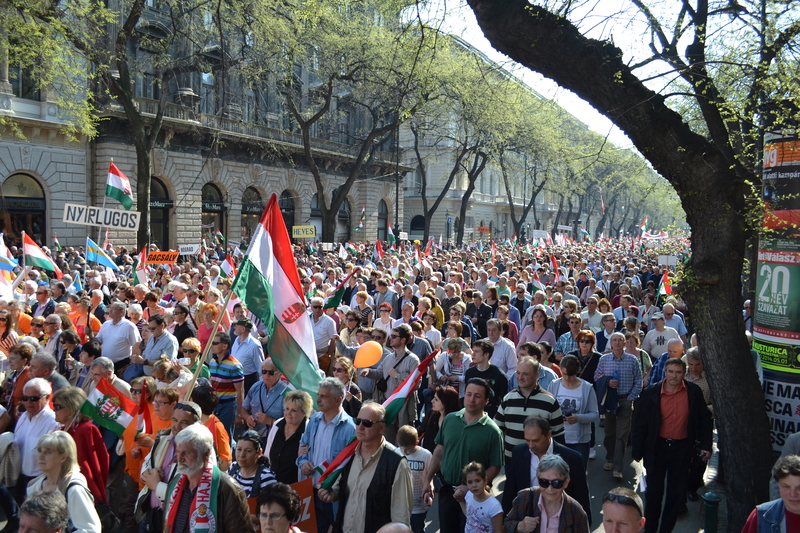 The text on the lead banner reads “The Country is One – April 6, 2014” in reference to next weekend’s national election that will likely provide Fidesz with another two-thirds super-majority in the National Assembly. 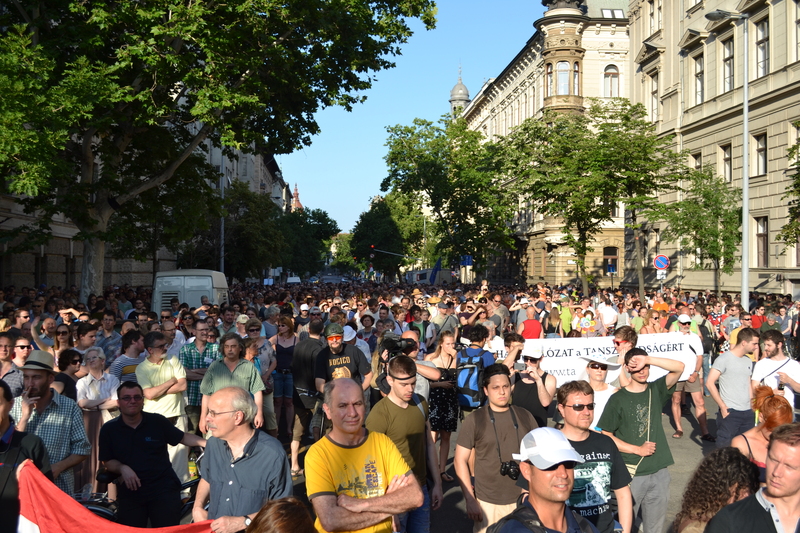 Peace March organizers hold the banner in their established positions: Bayer; Fricz; Stefka, Széles, Csizmadia and Bencsik (see Peace March Demonstrations). Fluorescent-vested security personnel push ahead with a rope stretched across the street to keep photographers from impeding the progress of the march; snap after snap on the backpedal down Bajcsy-Zsilinszky Avenue, all of the banner holders make eye contact: Bencsik, the inveterate showman, waves, shows thumbs up and smiles mockingly for the camera, Bayer and his wife regard the photographer with suspicion, while “Bulldog” Széles presents the challenging face, blinking, nodding, powerful jawbone always on the move. Long Live Russian-Hungarian Friendship! Long Live Our Wise Leader Viktor! 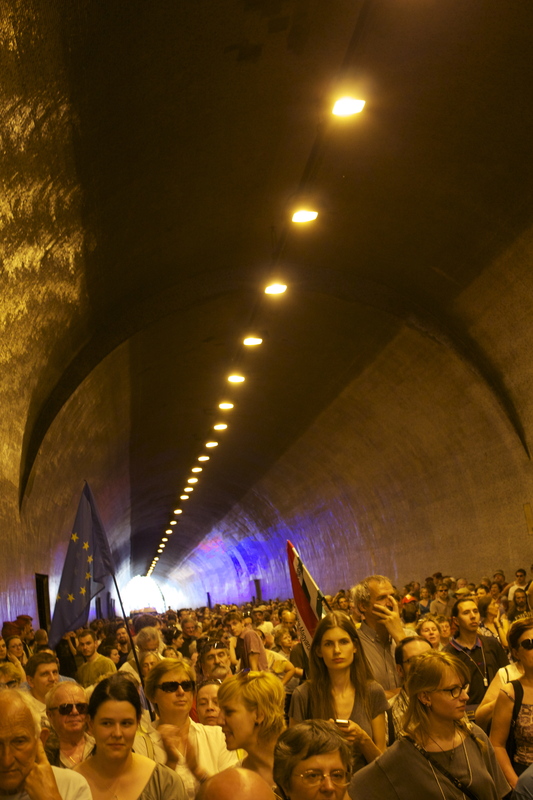 Pro-Fidesz and opposition sources will issue widely varying estimations regarding the number of participants: whatever the precise figure, it was again one hell of a lot, more than one-hundred thousand and maybe two- or three-hundred thousand. Who can keep count when there are so many? The signs are less hostile than at previous Peace Marches, mostly just Orange ones reading”Fidesz” and images of the Hungarian flag with the words “Vote” and “April 6.” A small group of counter-demonstrators wearing red Pioneer-movement neckerchiefs, the same ones who appeared at Prime Minister Viktor Orbán‘s March 15 speech (see Ides of March), has set up a stage at the end of Bajcsy-Zsilinszky Avenue under a banner that reads “Long Live Russian-Hungarian Friendship! 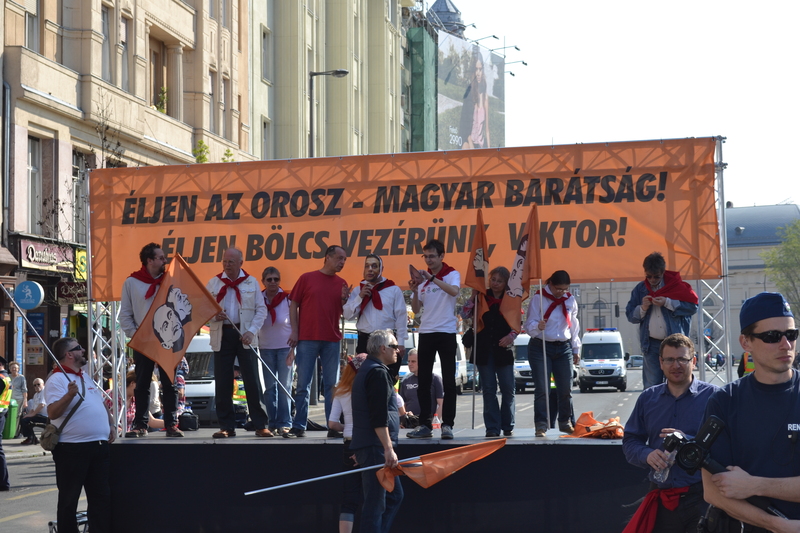 Long Live Our Wise Leader Viktor!” The comparison between the Fidesz and communist systems has clearly hit home: marchers hiss and grumble as they turn past stage on their way up Andrássy Avenue. 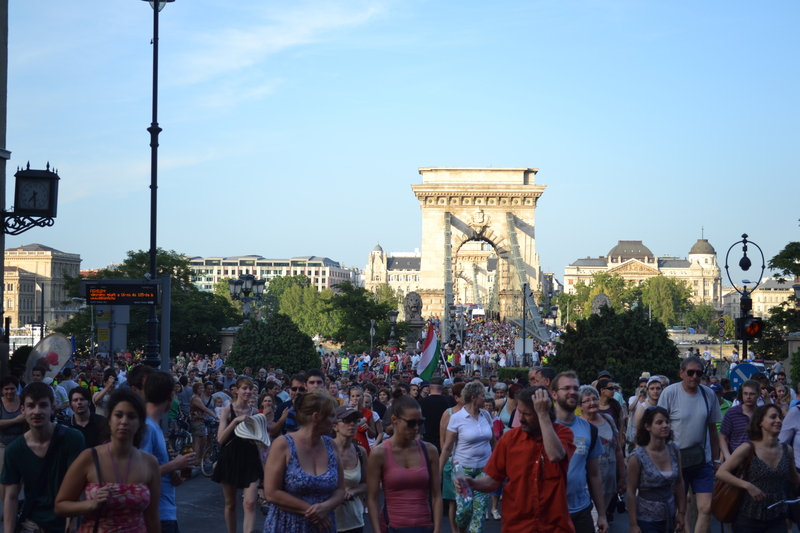 The Peace March proceeds down Andrássy Avenue toward Heroes’ Square. Amid the mass of mostly elderly voters from the provinces on Heroes’ Square, two of the most boring political speeches one can imagine, one from the French president of the European People’s Party and one from the president of the Alliance of Vojvodina Hungarians, before Prime Minister Orbán steps to the microphone to repeat the message he has honed so well over the years and which exercises such a mesmerizing effect on his supporters: revolution in the voting booth, eternal struggle against Hungary’s adversaries, national unity in a hostile world, continual fight against the treachery and corruption of the post-communists. Unchanging messages that will sustain this overstrung system, a perfect reflection of its creator, until one day four years or eight years or ten years from now when it suddenly flies apart. See Orange Files photo gallery of Peace March.